zero; tare / manual tare; enable / disable function; print; switch-off. zero; tare; enable / disable function; print; switch-off. 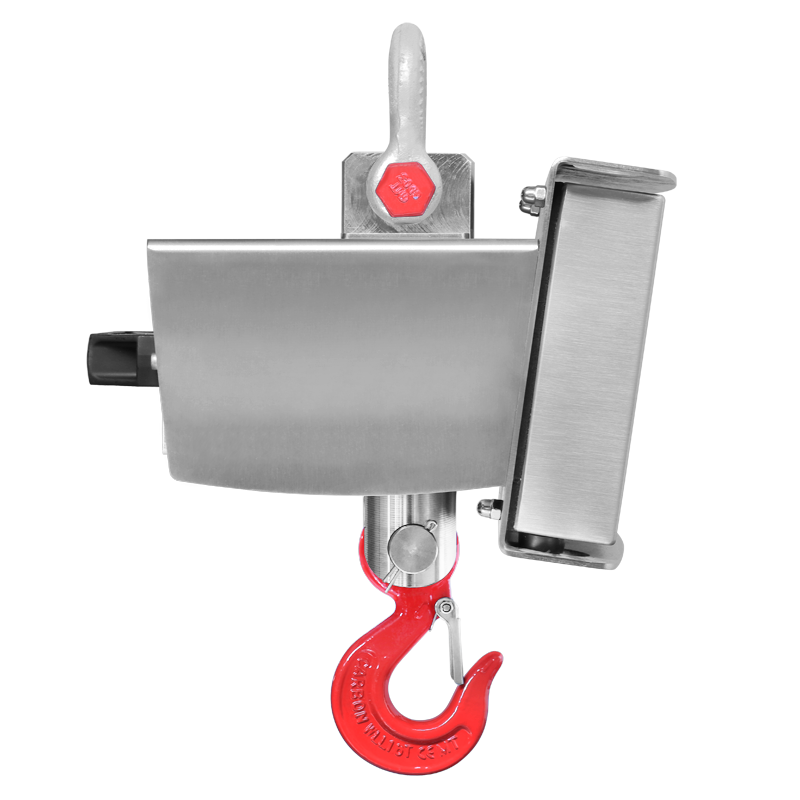 Reliable and easy to use AISI 304 stainless steel crane scales suitable for indoor and outdoor use, for industrial weighing applications. Reduced lifting distance of the crane. 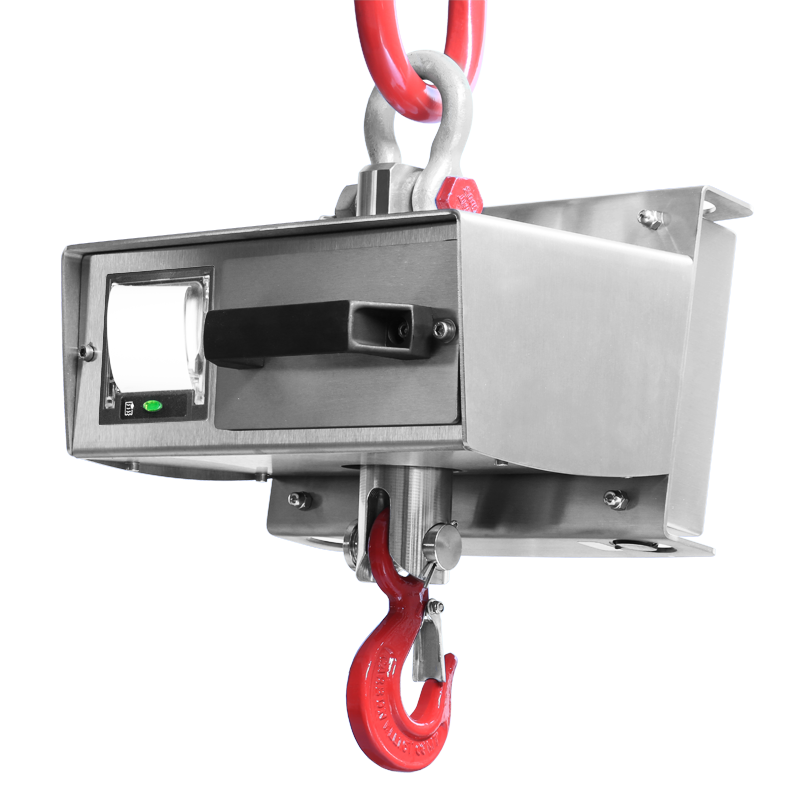 The single security system makes them suitable for lifting and weighing the load. IP67 protection from dust and rain. Available also CE-M APPROVED. Fitted with test certificate obtained with sample weights. 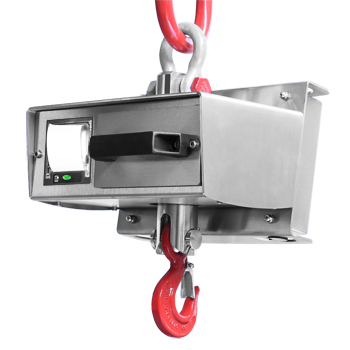 Single security system, for the lifting and the weighing of the load. In compliance with the directives 2006/42 CE, UNI EN 13155/2009, UNI EN 13889, 2014/30/EU. Large backlit 25mm LCD display easily visible in all lighting conditions and also with low temperatures. 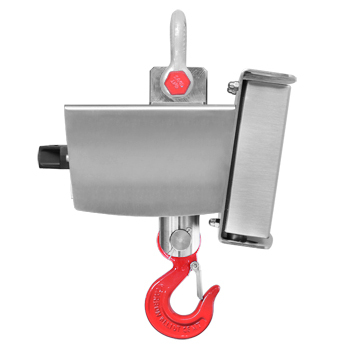 Fitted with standard approved upper galvanized shackle and standard approved bottom hook. GR3 and GOC1 for MCWR2 (150/300/600/1500). PEAK (maximum value read), HOLD (blocking the weight viewed), Weighs accumulation, lb/kg/N conversion. See the user manual for the list of the functions. Rechargeable sealed battery with a 40-hour life battery. On request, it is available a second battery for a 24/7 use. Operating temperature: -10 /+40 ºC. 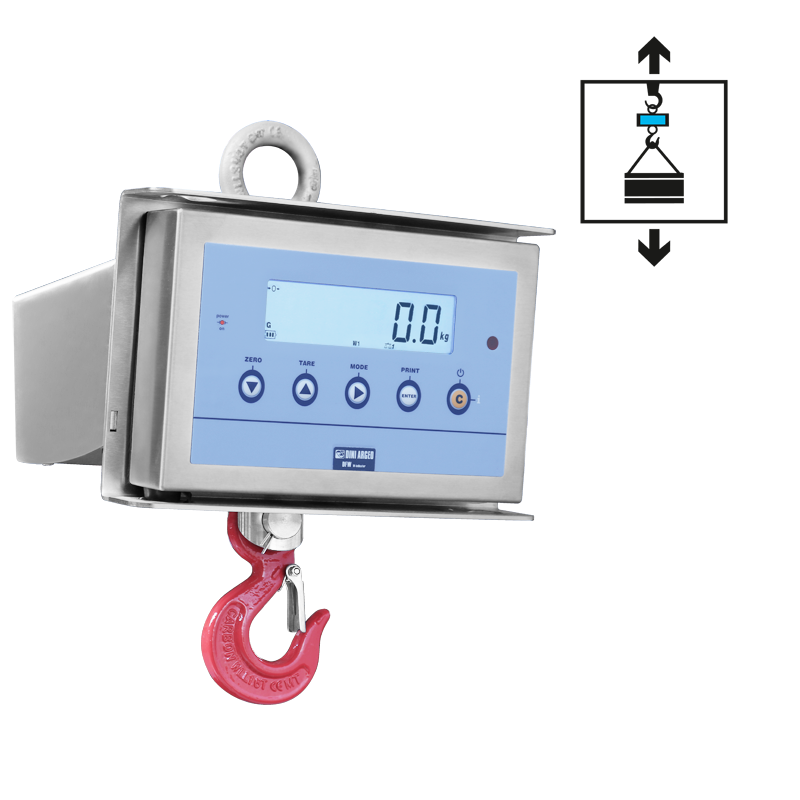 RF weight transmission to remote indicator up to over 70m indoors, 150m outdoors, adeguate environmental and installation conditions. 433MHz radiofrequency remote control (compatible with remote indicator). DOT red LED display of 40mm. Second battery for a 24/7 use (code MCWKBK). ACCREDIA calibration certificate according to OIML/ASTM standards. Remote weight indicator (see DFW.., 3590.., TRS.., DGT60.. Series' indicators) with printer connected through radio frequency. EHR High resolution model for internal factory use. MCWKBK Kit for continuous use 24/7 made up of extractable battery and device for the recharge with status indication, to be used with the supplied charger. Not compatible with MCW09T50 model. BLTH-2 (S1) Built-in bluetooth interface. For wireless connection to the portable PC or PDA. 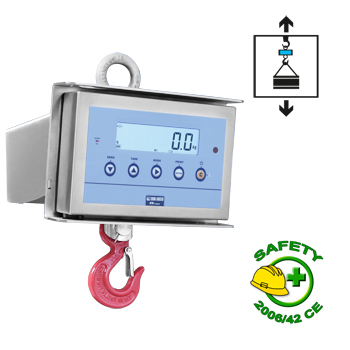 Weighing app downloadable from Google Play. WIFITPWLK (S1) Built-in WI-FI interface. For wireless connection (through access point) to the company computer system. RFITRMCW-2 (S1) Integrated 868 MHz radio frequency module on the crane scale, complete of RS232 port. Max. functioning distance in appropriate environmental and installation conditions: 70m indoors, 150m outdoors. Up to 50 configurable channels. OBRF232-2 External 868 MHz radio module with ABS box and cable l=3m. Fitted with DB9 connector and external power adapter. Max. functioning distance, in appropriate environmental and installation conditions: 70m indoors, 150m outdoors. 50 configurable channels. (OBRF232 must be combined with another radio module). OBRFUSB-3 External 868 MHz radio frequency module, USB cable l=1m. Power supply directly from the USB port. Max. functioning distance, in appropriate environmental and installation conditions: 70m indoors, 150m outdoors. 50 configurable channels. DGT60R-1 Weight repeater with 60 mm LED display. IP68 stainless steel case, 5-key keypad, air valve for regulating the humidity and the pressure, and configurable protocol. DFWXP 5-key indicator. IP65 ABS case, backlit LCD display. DFWKPXP 17-key indicator with attached printer and real time clock. ABS case, backlit LCD display. DFWPM-2 Portable weight repeater for radio frequency communication, with ABS case, 5-key keypad and backlit LCD display. Fitted with integrated radio module. DFWPM10USB-2 Portable weight repeater for radio frequency communication, with ABS case, 5-key keypad and backlit LCD display. Fitted with integrated Radio module, mini USB port and memory for recording the weighs. OBRF-2 (S1) External 868 MHz radio module, cable l=3m. ABS IP65 protecting box, 3 m cable, power supply from weight indicator. Max. distance, in appropriate environmental and installation conditions: 70m indoors, 150m outdoors. 50 configurable channels. TPRPR2 Thermal printer integrated to the crane scale, fitted with connection cable and power supply from the instrument. TLR-1 (S1) Radio frequency remote control and receiver. 433MHz, with 6 key, for use up to 50 m of distance, in appropriate environmental conditions (incompatible with repeater indicator or MSTSLV option). MCWLBR2 Display with 40mm red SMD LED digits. For "MCW...R2" models. CA2 Connection ring 2 t.
CA4 Connection ring 4 t.